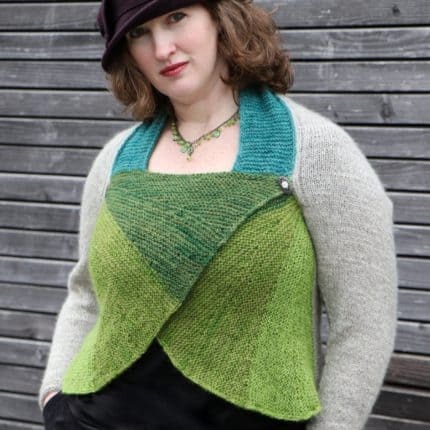 ← FiberCrafty is like a 24-hour fiber festival! 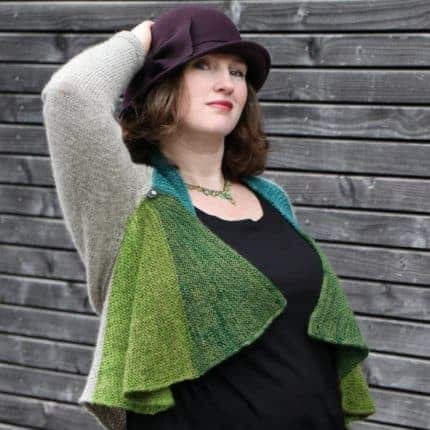 Introducing Kadigan – fun with short rows! I had so much fun with Kadigan, my newest design. (Kadigan is an old placeholder word – a thingamajig, a wotsit. How could I resist using that?) I love the style, which offers three different looks, but the making is the best part. It’s a bit quirky, but so rewarding. 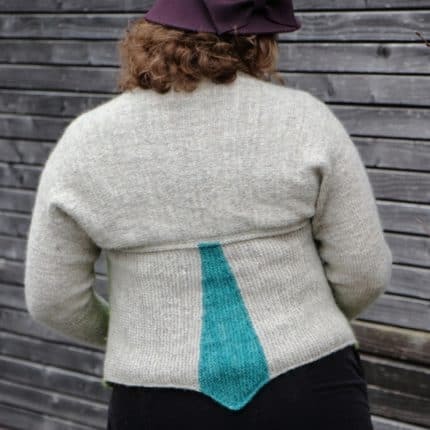 You start with a basic shrug, then pick up stitches and work the skirt sideways using garter stitch short rows, ie basically the most enjoyable knitting there is. This construction has two great benefits. One is the simplicity of it: you follow an internal logic rather than the numbers, so although there’s always something going on, you don’t have to check the pattern much. The second is the adaptability. 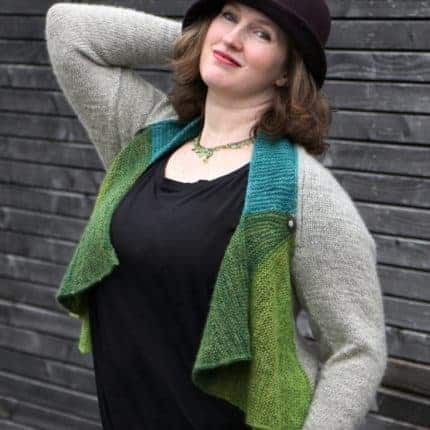 You can adjust virtually any part of it to fit your specific shape, without any maths, and I wrote the pattern specifically to encourage knitters to make the most of this. Start by picking your size based on upper arm measurement, because that’s the most fixed aspect. Adjust the sleeve length if needed. Try it on as you go to get a perfect fit across your shoulders. Then grab an inchtape and choose the right size for the front pieces. 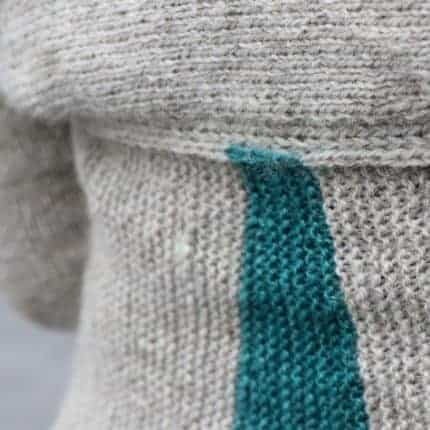 Follow a different set of instructions depending on whether you want to lengthen or shorten the back, and by how much. See? Perfect custom sizing, and no calculator required! It’s surprisingly addictive. 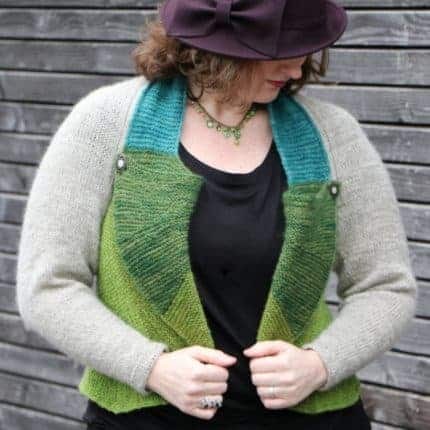 My testers are already talking about their second Kadigans, and I’m planning at least two more. I hope you have as much fun with it as I have!